R3 seems to be getting more banks on board. This week, they announced that 5 more banks have joined their global network and also that Mike Hearn, a Bitcoin Core Dev has joined their team. 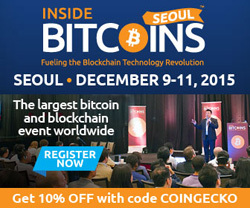 Inside Bitcoins Seoul is December 9-11! Continuing the largest bitcoin event worldwide, Inside Bitcoins Seoul, with a Fintech and Blockchain agenda, will host an expo hall plus engaging tutorials and conference sessions, including a Startup Competition with a prize worth KRW 2 million. Find out more about what to expect, including a full agenda and list of exhibitors. Take 10% OFF your pass when you use code ‘COINGECKO.’ Register today! While R3 CEV continues to rack up the number of banks joining their consortium, several core team members have been announced, including seasoned Bitcoin core developer Mike Hearn. Blockchain payments startup Align Commerce has raised $12.5m in Series A funding led by Kleiner Perkins Caufield & Byers. Coinbase has introduced the first US-issued bitcoin debit card, the Shift Card. The Shift Card is a VISA debit card that currently allows Coinbase users in twenty-four states in the U.S. to spend bitcoin online and offline at over 38 million merchants worldwide. Nasdaq Co-President Hans-Ole Jochumsen mentioned that Nasdaq is planning to develop several blockchain applications through its operations in Estonia. Nasdaq owns the Tallinn Stock Exchange, Estonia's only regulated secondary securities market, as well as the Estonian Central Securities Depository (ECSD). Amazon has started to ship the 21 Bitcoin computers. It will be interesting to look out for reviews in the coming weeks as more people receive their 21 Bitcoin computers. Spanning across 5 days with 60+ talks, over 400 attendees and 15,000+ viewers of the livestream, this year’s Ethereum Developer Conference, was an “absolutely fabulous” success. Brazil’s House of Representatives held a hearing this week to discuss a bill that would give the country’s central bank oversight of digital currencies. The Japan government is gearing up to regulate bitcoin activity more actively in the wake of the collapse of the now-defunct bitcoin exchange Mt Gox. Consulting and technology services firm Capgemini recently published a report saying that financial services firms can no longer "afford to ignore" blockchain technology. It also mentioned BitShares, Counterparty, Ethereum, Factom and Ripple as part of the report.